Rihanna partied again in Los Angeles last night after shooting a top secret ad campaign. She once again ditched the long locks for a short pixie cut with brown highlights. Rih wore a camouflage leather jacket designed by Pyer Moss. According to their lead designer the jacket will be in select stores very soon. 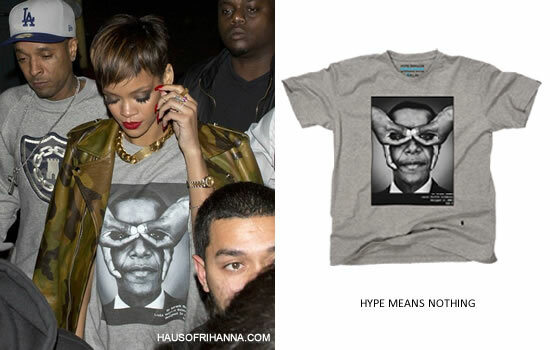 Riri also donned a Barack Obama tee by Hype Means Nothing. She is no stranger to the brand as she wore their Jay-Z tee just over a year ago. She finished the outfit with simple black pants and her favourite Tom Ford ankle chain sandals.